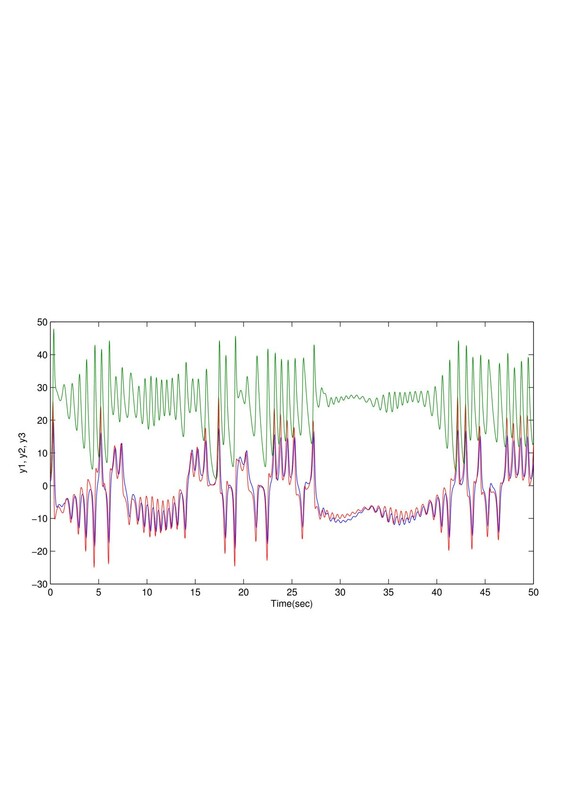 This paper investigates drive-response robust synchronization of chaotic systems with disturbance, time-varying delay and input saturation via state feedback control. Sufficient conditions for achieving the synchronization of two chaotic systems are derived on the basis of the Lyapunov theory and the linear matrix inequality (LMI) technique, which is not only to guarantee the asymptotic synchronization but also to attenuate the effects of the perturbation on the overall error system to a prescribed level. Finally, an illustrative numerical simulation is also given to demonstrate the effectiveness of the proposed scheme. In 1963, Lorenz found the first chaotic attractor in a three-dimensional autonomous system when he studied the atmosphere convection . Since then, more chaotic systems have been constructed, such as Chua’s circuit, logistic map, Chen system, and generalized Lorenz system (see [2–6]), and their complex behaviors have also been widely studied. Nowadays, there has been considerable interest in the control of chaos in nonlinear dynamical systems, and many different techniques, such as OGY method , PC technique , backstepping approach , adaptive control , fuzzy control , digital control , state feedback control , time-delay feedback control , sampled driving signals , and observer-based approach , have been proposed to control chaos. Since the pioneering work by Pecora and Carroll  who originally proposed the drive-response concept for achieving the synchronization of coupled chaotic systems, chaotic synchronization has received considerable attention due to its potential applications in physics, biology, and engineering and has become an important topic in control theory [18, 19]. However, all of these works and many others in the literature have focused on the study of chaotic synchronization between two chaotic systems without model uncertainties and external disturbance. In real physical systems, some noise or disturbance always exists, which may cause instability and poor performance. Therefore, how to reduce the effect of the noise or disturbance in synchronization process for chaotic systems has become an important issue, see [20–22]. On the other hand, there has been increasing interest in time-delay chaotic systems since the chaos phenomenon in time-delay systems was first found by Mackey and Glass . For chaotic systems with time-delay and disturbance, several works have proposed the problem for various chaotic systems in the literature [24–26]. In , an adaptive control law was derived and applied to achieve the state lag-synchronization of two nonidentical time-delayed chaotic systems with unknown parameters. In , an output coupling and feedback scheme were proposed to achieve the robust synchronization of noise-perturbed chaotic systems with multiple time-delays. 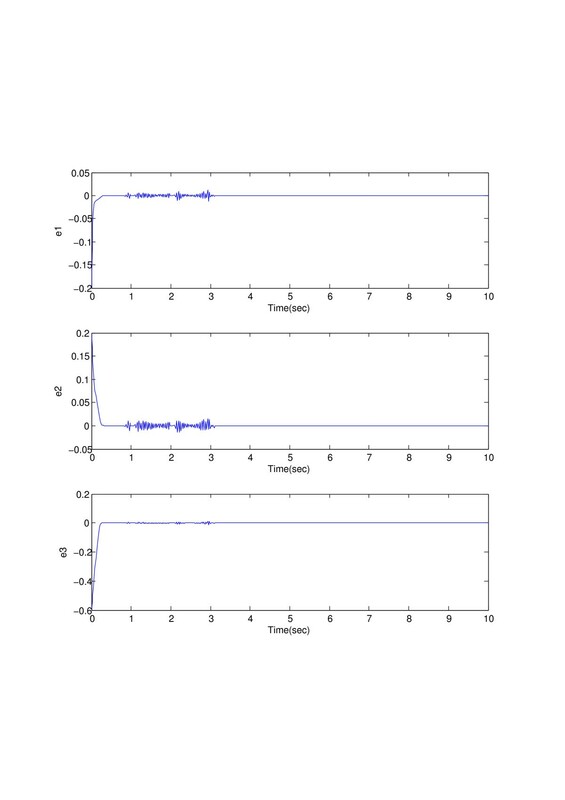 An impulse control was proposed by Qian and Cao  to synchronize two nonidentical chaotic systems with time-varying delay. Most of them are based on the fact that the time-delay is a constant, while, in real world applications, the time-delay is also varying over time. Hence the study of chaotic synchronization with time-varying delay is an important topic. Besides, in a practical chaos system, there exist not only disturbance and varying-time delay but also the input saturation. Many literature works are based on the assumption that the actuator will not be saturated during the control process, but actuator will saturate due to its physical limitations in practice. Due to its high sensitivity to system parameters, the presence of saturation of control input may cause serious influence on system stability and performance. Hence, the derivation of controller with input saturation is an important problem. In , an adaptive sliding mode control scheme for Lorenz chaos subject saturating input was presented. Rehan studied the synchronization and anti-synchronization of chaotic oscillators under input saturation via simple state feedback control in , and the design of dynamic controller and static anti-windup compensator for Lipschitz nonlinear systems under input saturation was described in  and . However, most of them studied the normal chaotic system without time-delay and the inner uncertainty and the external disturbance. Motivated by the above discussion, in this paper we investigate the synchronization of chaotic systems with disturbance and varying time-delay under input saturation. Based on the Lyapunov stability theory, a robust controller is designed and its robustness and stability are analytically proved. Finally, we present a numerical simulation to demonstrate the feasibility and usefulness. This paper is organized as follows. Section 2 provides the system description. In Section 3, LMI-based conditions for chaotic synchronization are developed. In Section 4, a numerical example is given to illustrate the main result. Finally, conclusion is made in Section 5. Standard notation is used in this paper. For a matrix M, the i th row is denoted by M ( i ) . For a vector u ∈ R m , sat ( u ) = sign ( u ( i ) ) min ( u ¯ ( i ) , | u ( i ) | ) represents the classical nonlinear saturation function, where u ¯ ( i ) > 0 denotes the i th bound on the saturation. F T ( t ) F ( t ) ≤ I .
where y ( t ) ∈ R n , u ∈ R m and w ( t ) ∈ R n are the state, the input, and the external disturbance vectors for the response system, respectively, and sat ( u ) ∈ R m represents the saturated input. C ∈ R n × m represents a constant matrix. d e d t = ( A + Δ A ) e ( t ) + ( B + Δ B ) e ( t − τ ( t ) ) + f ( x ) − f ( y ) − C sat ( u ) − w ( t ) . This paper aims at designing the controller to not only asymptotically synchronize between the drive and the response systems but also to guarantee a prescribed performance of the external perturbation attenuation γ. Before presenting the main result, we introduce the following definition. With w ( t ) = 0 , the dynamics error system (5) is asymptotically stable. J = ∫ 0 ∞ ( e T ( t ) e ( t ) − γ 2 w T ( t ) w ( t ) ) d t ≤ 0 . In dealing with this study, the following assumptions and lemmas are necessary for the sake of convenience. Assumption 1 The time-delay τ ( t ) is a bounded and continuously differentiable function such that 0 ≤ τ ( t ) ≤ μ 1 and 0 < τ ˙ ( t ) ≤ μ < 1 . 2 x T y ≤ 1 ε x T x + ε y T y . Let S 11 be a regular n × n matrix, S 12 can be an n × q matrix, and S 22 is a regular matrix. Let a Hermitian matrix S be represented as S = ( S 11 S 12 S 12 T S 22 ) . Then the matrix S is positive definite if and only if the matrices S 11 and S 22 − S 12 T S 11 − 1 S 12 are positive definite. d e d t = ( A − C F + Δ A ) e ( t ) + ( B + Δ B ) e ( t − τ ( t ) ) + f ( x ) − f ( y ) + C ϕ ( u ) − w ( t ) . with Ξ = X 1 A T + A X 1 − C X 2 − X 2 T C T + 1 ε 3 I , then the overall closed-loop system with Eq. (5) is H ∞ synchronized with the disturbance attenuation level γ.
where V 1 ( t ) = e T ( t ) P e ( t ) , V 2 ( t ) = 1 1 − μ ∫ t − τ ( t ) t e T ( s ) R e ( s ) d s , P = P T , R = R T .
V 1 ( t ) = e ˙ T ( t ) P e ( t ) + e T ( t ) P e ˙ ( t ) = e T ( t ) ( A T P + P A − F T C T P − P C F ) e ( t ) + e T ( t ) ( Δ A T P + P Δ A ) e ( t ) + e T ( t − τ ( t ) ) B T P e ( t ) + e T ( t ) P B e ( t − τ ( t ) ) + e T ( t − τ ( t ) ) Δ B T P e ( t ) + e T ( t ) P Δ B e ( t − τ ( t ) ) + ( f ( x ) − f ( y ) ) T P e ( t ) + e T ( t ) P ( f ( x ) − f ( y ) ) + ϕ T ( u ) C T P e ( t ) + e T ( t ) P C ϕ ( u ) − w T ( t ) P e ( t ) − e T ( t ) P w ( t ) . ( f ( x ) − f ( y ) ) T P e ( t ) + e T ( t ) P ( f ( x ) − f ( y ) ) ≤ e T ( t ) ( 1 ε 3 P P + ε 3 ρ I ) e ( t ) . V ˙ 1 ( t ) ≤ e T ( t ) ( A T P + P A − F T C T P − P C F ) e ( t ) + e T ( t ) ( ε 1 E 1 T E 1 + 1 ε 1 P H 1 H 1 T P + 1 ε 2 P H 2 H 2 T P + 1 ε 3 P P + ε 3 ρ I ) e ( t ) + ε 2 e T ( t − τ ( t ) ) E 2 T E 2 e ( t − τ ( t ) ) + e T ( t − τ ( t ) ) B T P e ( t ) + e T ( t ) P B e ( t − τ ( t ) ) + ϕ T ( u ) C T P e ( t ) + e T ( t ) P C ϕ ( u ) − w T ( t ) P e ( t ) − e T ( t ) P w ( t ) . ϕ T ( u ) W ( G e − ϕ ( u ) ) ≥ 0 . V ˙ 1 ( t ) ≤ e T ( t ) ( A T P + P A − F T C T P − P C F ) e ( t ) + e T ( t ) ( ε 1 E 1 T E 1 + 1 ε 1 P H 1 H 1 T P + 1 ε 2 P H 2 H 2 T P + 1 ε 3 P P + ε 3 ρ I ) e ( t ) + ε 2 e T ( t − τ ( t ) ) E 2 T E 2 e ( t − τ ( t ) ) + e T ( t − τ ( t ) ) B T P e ( t ) + e T ( t ) P B e ( t − τ ( t ) ) + e T ( t ) ( P C + G T W ) ϕ ( u ) + ϕ T ( u ) ( W G + C T P ) e ( t ) − 2 ϕ T ( u ) W ϕ ( u ) − w T ( t ) P e ( t ) − e T ( t ) P w ( t ) . V ˙ 2 ( t ) ≤ 1 1 − μ e T ( t ) R e ( t ) − e T ( t − τ ( t ) ) R e ( t − τ ( t ) ) . − Q + R < 0 . V ˙ ( t ) = V ˙ 1 ( t ) + V ˙ 2 ( t ) ≤ e T ( t ) ( A T P + P A − F T C T P − P C F ) e ( t ) + e T ( t ) ( 1 1 − μ Q + ε 1 E 1 T E 1 + 1 ε 1 P H 1 H 1 T P + 1 ε 2 P H 2 H 2 T P + 1 ε 3 P P + ε 3 ρ I ) e ( t ) + 1 1 − μ e T ( t ) ( − Q + R ) e ( t ) + e T ( t − τ ( t ) ) ( − R + ε 2 E 2 T E 2 ) e ( t − τ ( t ) ) + e T ( t − τ ( t ) ) B T P e ( t ) + e T ( t ) P B e ( t − τ ( t ) ) + e T ( t ) ( P C + G T W ) ϕ ( u ) + ϕ T ( u ) ( W G + C T P ) e ( t ) − 2 ϕ T ( u ) W ϕ ( u ) − w T ( t ) P e ( t ) − e T ( t ) P w ( t ) ≤ e T ( t ) ( A T P + P A − F T C T P − P C F ) e ( t ) + e T ( t ) ( 1 1 − μ Q + ε 1 E 1 T E 1 + 1 ε 1 P H 1 H 1 T P + 1 ε 2 P H 2 H 2 T P + 1 ε 3 P P + ε 3 ρ I ) e ( t ) + e T ( t − τ ( t ) ) ( − R + ε 2 E 2 T E 2 ) e ( t − τ ( t ) ) + e T ( t − τ ( t ) ) B T P e ( t ) + e T ( t ) P B e ( t − τ ( t ) ) + e T ( t ) ( P C + G T W ) ϕ ( u ) + ϕ T ( u ) ( W G + C T P ) e ( t ) − 2 ϕ T ( u ) W ϕ ( u ) − w T ( t ) P e ( t ) − e T ( t ) P w ( t ) . J ( e ( t ) , w ( t ) ) = V ˙ ( t ) + e T ( t ) e ( t ) − γ 2 w T ( t ) w ( t ) . Ω = [ Ω 1 P B G T W + P C P ∗ − R + ε 2 E 2 T E 2 0 0 ∗ ∗ − 2 W 0 ∗ ∗ ∗ − γ 2 I ] , Ω 1 = A T P + P A − F T C T P − P C F + 1 1 − μ Q + ε 1 E 1 T E 1 + 1 ε 1 P H 1 H 1 T P + 1 ε 2 P H 2 H 2 T P + 1 ε 3 P P + ε 3 ρ I + I .
Ω 1 = A T P + P A − F T C T P − P C F + 1 1 − μ Q + ε 1 E 1 T E 1 + 1 ε 1 P H 1 H 1 T P + 1 ε 2 P H 2 H 2 T P + 1 ε 3 P P + ε 3 ρ I + I .
V ( ∞ ) − V ( 0 ) + ∫ 0 ∞ ( e T ( t ) e ( t ) − γ 2 w T ( t ) w ( t ) ) d t ≤ 0 . A = [ − 10 10 0 28 − 1 0 0 0 − 8 / 3 ] , B = [ 1 0 0 0 − 1 0 0 0 2 / 3 ] , C = [ 2 0 0 0 2 0 0 0 2 ] , H 1 = [ 0.1 0 0.1 0 0.1 0 0.1 0 0.2 ] , H 2 = [ 1 0 0 0 2 0 0 0 1 ] , E 1 = [ 1 0 0 0 1 0 0 3 2 ] , E 2 = [ 0.1 0 0 0 0.2 0 0 0 0.1 ] , f ( x ) = ( 0 − x 1 x 3 x 1 x 2 ) , u ¯ = ( 2 2 2 ) . The Lipschitz constant is chosen as ρ = 1 , and the parameter δ is given as δ = 1 . The disturbance is selected as w ( t ) = ( 0.1 sin 10 t 0.2 sin 20 t 0.1 sin 30 t ) T . For convenience, we choose τ ( t ) = 1 . 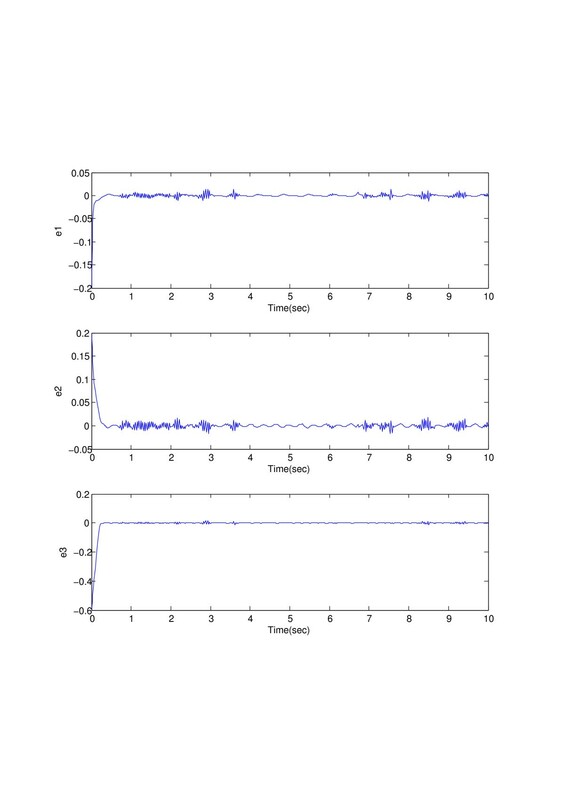 The chaotic behavior of Lorenz system with time-delays is shown in Figures 1 and 2. Chaotic behavior of the Lorenz system with time-delays. Chaotic behavior of the Lorenz system with time-delays and disturbance. F = [ 29.4692 16.4469 1.5622 25.9050 39.8604 7.1042 1.6037 4.9806 28.5541 ] , G = [ 28.6094 16.1171 1.4984 25.5716 39.5272 7.0591 1.5686 4.9206 27.6124 ] , P = [ 4.7185 2.7094 0.1772 2.7094 4.1320 0.7937 0.1772 0.7937 4.1079 ] , R = [ 1.1866 − 0.0227 0.0027 − 0.0227 1.6894 − 0.0052 0.0027 − 0.0052 1.1703 ] . Applying the controller u = F e without the disturbance signal, the synchronization error between the drive system and the response system with the initial conditions x 0 = ( 1 2 3 ) T and y 0 = ( 1.2 1.8 3.6 ) T , respectively, is shown in Figure 3, which implies that the synchronization error converges to zero. Figure 4 shows that the effect of the disturbance w ( t ) on the dynamic error system has been reduced within a prescribed level to γ = 0.5 by the control gain F.
Synchronization error of the Lorenz system without the disturbance w ( t ) . 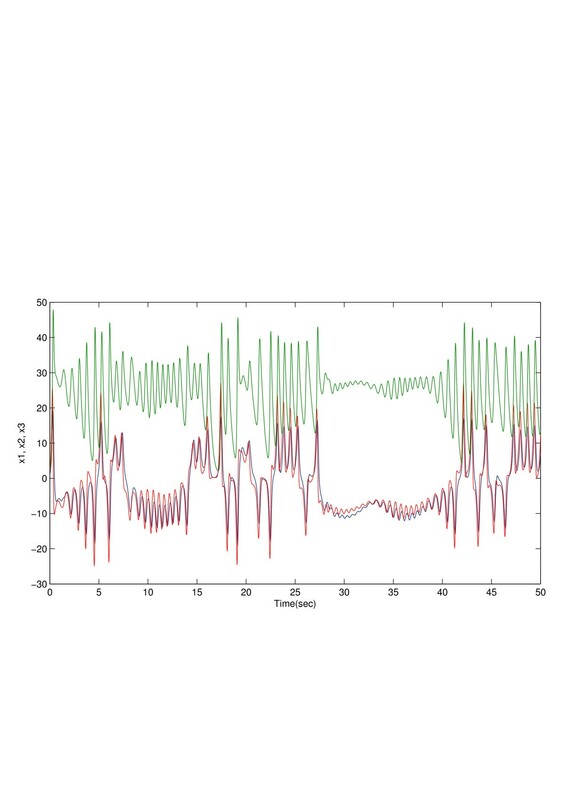 Synchronization error of the Lorenz system with the disturbance w ( t ) . The problem of robust H ∞ synchronization for an uncertain chaotic system with time-varying delay and input saturation has been presented. Based on the Lyapunov theory and the LMI technique, the sufficient condition has been derived not only to guarantee the asymptotic synchronization but also to ensure a prescribed perturbation attenuation performance. Finally, a simulation example is presented to verify the validity of the proposed method. This paper is supported by the National Natural Science Foundation of China (No. 61273004). The authors also gratefully acknowledge the helpful comments and suggestions of the reviewers, which have improved the presentation. The authors have made the same contribution. All authors read and approved the final manuscript.